I have taught a class called Information Technology Project Management at Oklahoma State University for the past four and a half years and it really is one of the standout parts of my job. While I do miss teaching high school, which I did in Minnesota for several years, I have really come to appreciate working at a university and also teaching college-age students. Many of them in my class are near graduation and they are getting ready to move away, start careers, or take a year off to just go see the world. It’s a fun opportunity to be able to teach them and each semester I cap off my class with a batch of homemade chocolate chip cookies. I always like to involve my kids in this process and usually make their consuming of said cookies contingent on their willingness to pitch in with the creation process. Normally I would just stand near them, hold my camera at eye level, and take a photo but this time I wanted to try something a bit different. I stood on a chair, held my Fuji X100F out at arm’s length, set the aperture to f/2.8, and fired off a few shots from directly above. 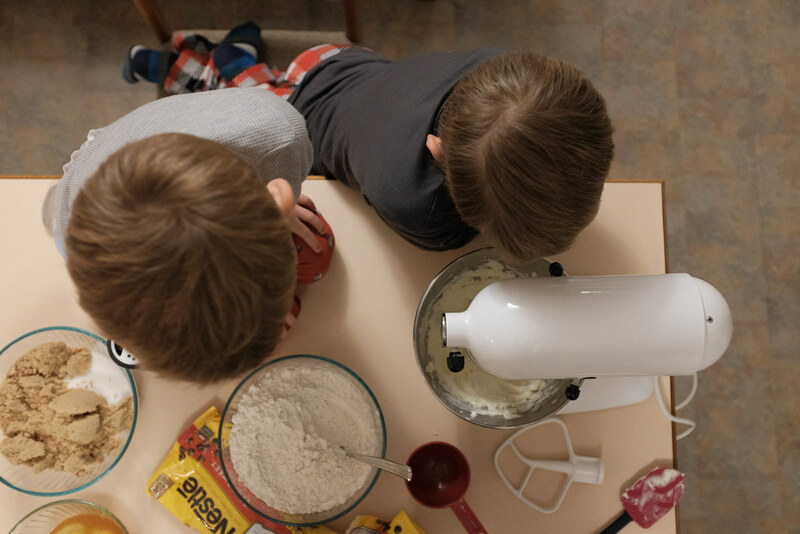 I rather like the result even though I wasn’t entirely sure where to focus, and as such my son’s head on the left is a bit blurry but I do think it works to draw the viewer’s attention to the mixing bowl and other baking implements. Wonderful Simon! I would have enjoyed receiving cookies at the end of a college class and I think that involving the boys is a great idea. Wonderful photo Simon. Even though I cannot see their faces, I can tell they are happy kids. Kudos to you for involving them in your love of teaching. On a technical note, I like that the child on the left is a bit out of focus. This makes my eye search for the in focus head, leading me to the mixing bowl. Your leading lines are a bit soft and well combed, but very effective. Thanks Rebecca, I’m glad you like the photo even with the slightly strange focus. I didn’t think about my son’s head being out of focus until it was too late, but I do think it works OK. This was definitely not an image where I paid attention to a lot of technical details! Awesome picture!! Reminds me of making cookies with my mom and my aunt and getting to lick the beaters!! What a fun memory, Jill. I’m glad this little slice of my own kids’ life helped you remember a special time in your boys’ lives as well.